The NETLINKS staircase. Located in the Shar-e-naw district of Kabul, the building served as my home for nearly three weeks. COO Javid (left) is suddenly upstaged by CEO Farshid after-hours in the NETLINKS Executive Office, Kabul, Afghanistan. Farshid shared his office with COO Javid Hamdard, who is now leaving NETLINKS for new opportunities. Javid offered incisive analysis on the U.S. presence in Afghanistan and a host of other issues in an interview I am excerpting below. But before you read the interview, you should watch the video below. Farshid and Javid provided more than lodging. Most days, they invited me into their office for lunch or refreshments, or a night out. They became for me the face of modern Kabul: smart, aspirational, compassionate, generous and patriotic. And after a stressfull day, the karaoke player was switched on. In one of my first nights there, quite possibly the first, Javid belt out the Celine Dion standard “My Heart Will Go On” with tremendous emotional conviction, though controversy ensued when Farshid tried to upstage him after grabbing the second mic. The video will either give you renewed hope for the worldy cultural openness of Afghanistan’s educated, professional class or you’ll conclude the country is doomed. You be the judge. Javid showing me his award. I met Javid Hamdard, co-executive at NETLINKS, during my first night living in the company office/ villa; Farshid and Javid invited me to their shared office for refreshments and an impromptu karaoke performance. Farshid, out of a sense of competition or uncontainable emotion, kept jumping in on Javid’s unforgettable rendition of Celine Dion’s My Heart Will Go On. 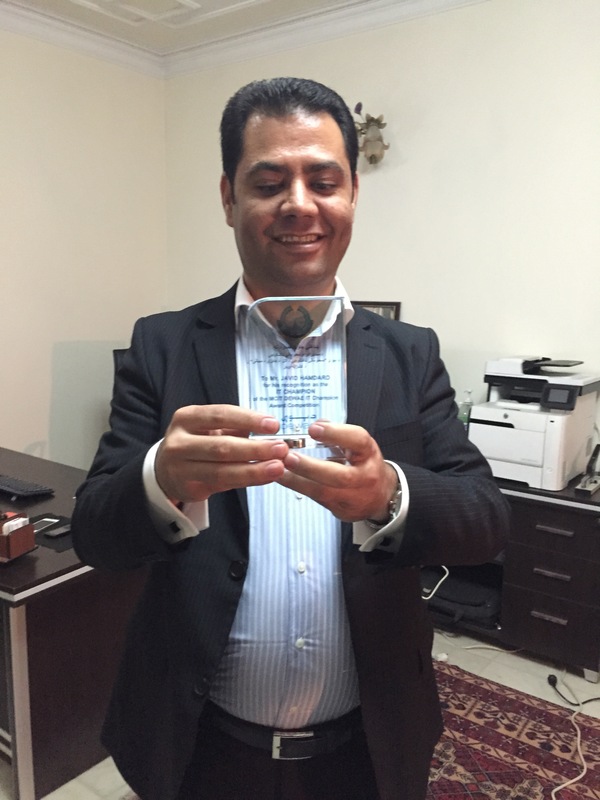 Hamdard won the Afghan national award for IT innovation during my stay. He donated the funds to charity, Islam’s call to zakat. It’s acknowledgement that everything one owns belongs to Allah and one works toward the betterment of the Muslim ummah. According to Islamic regulations, zakat is 2.5 percent of one year’s total cumulative wealth which is distributed to the poor. I ask Javid his sense of the U.S./ coalition mission in Afghanistan and what he thought was accomplished. Well, obviously it did not start as a humanitarian mission, as it started in reaction to the al-Qaeda attacks in New York, as a reactive combat mission. I personally think (the attacks) might not have happened if the U.S. did not abandon us like an orphan child after us winning the so-called ‘cold,’ but bloody hot for us, war for them. Of course later, the U.S. military presence was extended under the Bonn Conference under the ISAF’s assistance mission. So, all in all, a combat mission brought more war to Afghanistan. Farshid was an extraordinary host, providing lodging, hospitality, meals, introductions and his unique insights into Afghan politics and culture. It did end the barbaric reign of Taliban, and has brought some infrastructure development, economic stability and improvement and a government framework. There has been phenomenal development in the media and freedom of expression domain. Afghanistan has a better infrastructure in most areas, namely roads and aviation, telecoms, banking. The condition of higher education has visibly improved. And unlike 15 years ago, we have thousands of well-qualified Afghan youngsters with internationally accredited qualifications. There have been major improvements in the health sector, especially mother and child health, and the child mortality rate, which all became possible with the support of post 9/11 international support, led by the U.S. But, of course, there are many problems attached to this as with every combat mission. The most significant and tragic are: the continuing loss of life, including precious American lives, but mainly innocent Afghans till this day. The re-empowerment of some sidelined warlords and war criminals to a level that will be almost impossible to fix. The misuse and mismanagement of billions of valuable American taxpayer dollars on very superficial and unsustainable projects and programs that empowered corrupt and dangerous elements in the country. The alienation of a large majority of rural Afghans because of bad governance and the unfair distribution and outreach of international aid. His hope for the future of his country? I shared many meals and conversations with NETLINKS staff at this table near my bedroom. For midnight Skype calls to family and friends, I sometimes sat here in 20 degree F weather to be closer to the wfii router (seen on the left). I am still very optimistic for the future of Afghanistan. The source of my optimism is neither the American military and/or financial support nor our existing, mostly corrupt politicians and officials who are so honest and loyal to the country that most of their families are right now living comfortable and luxurious lives outside the country at the cost of millions of aid and assistance tax dollars of international donors meant for the common Afghan Joe/ Ahmad. But my source of optimism is mainly the ever-growing and increasing understanding and knowledge of the world and its ways among common Afghans, especially young Afghans who are way smarter than we were 14 or 30 years ago. The NETLINKS office had three posters as I recall: Steve Jobs, Martin Luther King, Jr. and Mohandas Ghandi. More than nine million of us are going to schools, many of us have seen the world and have been to the most prestigious educational institutions, have visited the most developed countries of the world. My sole source of optimism for a proper, peaceful, smart and equal Afghanistan is the more than 75 percent of under-30 years-of-age Afghans who will rise and grow as 21st century human beings, who will demand equal rights and treatment as such.